A must-have for all campers: a bipod for comfortable sniping. All three components of the Nerf Modulus Range kits are now available seperately. After the riflescope, the barrel extension and this bipod are starting a solo career. So for those who have always been particularly keen on a specific accessory, this is the right place! Those who prefer letting others run and take a more "stationary" strategy, is well advised with a bipod. Equipped with the Nerf Modulus bipod, you can position the blaster and make yourself comfortable. The bipod in the Modulus color scheme is simply sled onto the lower rail of a blaster or a barrel extension until the orange "thingy" locks in place. In case you are on the double, the legs of the bipod fold away for more mobility. Additionally, blasters can be very well presented at home with the bipod. 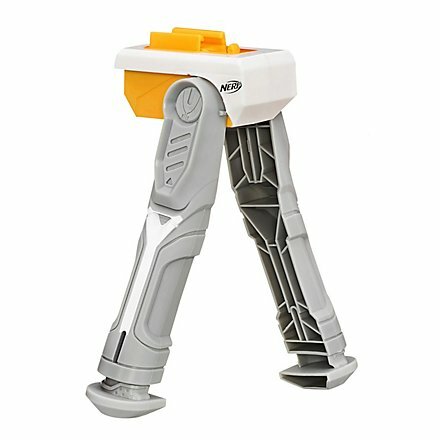 The bipod makes blasters stand up straight without falling over. Perfect to properly showcase your jewels. Blaster jewels. Instead of the usual colorful packaging, the bipod is delivered in an environmentally friendly recycled cardboard box. This type of packaging also protects your wallet, because this way we can offer Nerf accessories for an affordable price.